The daily moisturizing, Balancing Day Cream is formulated for daily use and extended outdoor activities with SPF 50. It helps deeply hydrate and improve skin elasticity while providing essential protection against environmental aggression. Intensely whitens, minimizes fine lines and helps reduce the appearance of scars and blemishes for smoother skin.Supports the skin's natural oil and moisture production leaving your skin visible supple and smooth. The Advanced Night Repair Serum as a skin whitening formula revitalizes, repairs and whitens skin at night when cell renewal is at its peak. Reveal a fairer and younger-looking skin. Wake up to more beautiful skin every day. Balancing Day Cream With Rice Protein. SPF 50 Moisurizing and sun protection. For fairer and flawless skin. 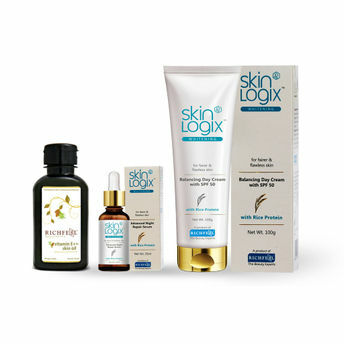 For best results, use in combination with Skin Logix Advanced Night Repair Serum Night Repair Serum With Rice Protein. Repairs and whitens skin at night. For best results, use in combination with Balancing Day Cream. Explore the entire range of Combos @ Nykaa available on Nykaa. Shop more Richfeel products here.You can browse through the complete world of Richfeel Combos @ Nykaa .